For a while now I've mentioned in various topics that I will be upgrading the forum soon to a significantly newer version. 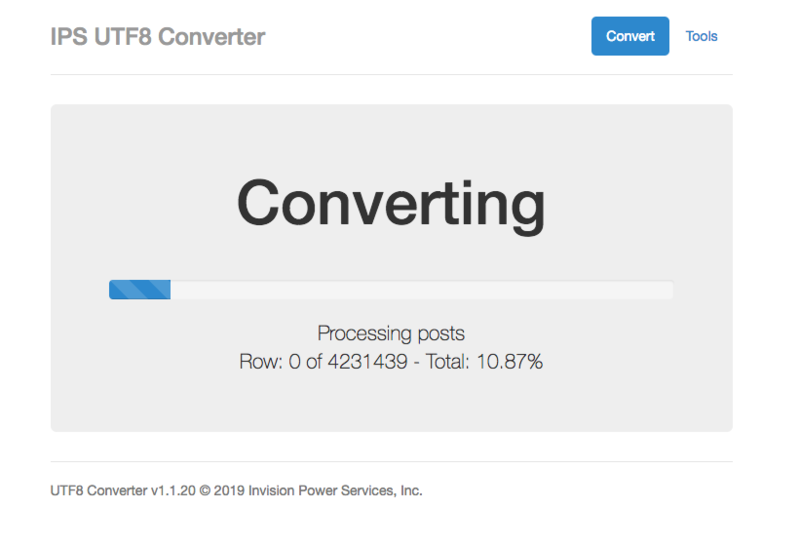 The current version of the software is now about four years old, which is roughly when Invision released a completely rewritten version of their Invision Power Board software (4.0). I held off upgrading initially for many reasons, for instance, at first they dropped support for third-party search engines, which is something we use here in order to greatly speed up searching. This was finally addressed last year, and over the course of four years version 4.x of the forum software has matured quite nicely, with lots of great features and improvements having been made during that time. The current version is now 4.4.1, and we are running 3.4.8. I've also had to rewrite nearly all the software on the main site (hosting the games database) as it was originally written in 2000-2001 by Alex and myself and hasn't seen many changes since then. That has been great...fun, but I've made significant progress and have completed most of the difficult files. Everything remaining I'll be able to churn through relatively quickly. This was a requirement before I could begin on the forum upgrade. This weekend I have leased a new, more powerful server to host the AtariAge web server (the database server lives on another server). My plan is to get the main site, forums, and store running on this new server and then "flip the switch" over to this new server once everything is working properly on it. However, the forums will still be down for a significant period of time when this happens, as I will need to take the forums down, copy the database and any new/changed files to the new server, then begin the time consuming upgrade tasks to convert the database to the latest version of the forum. I'll have a better idea of how long this will take after I've done a few test conversions. 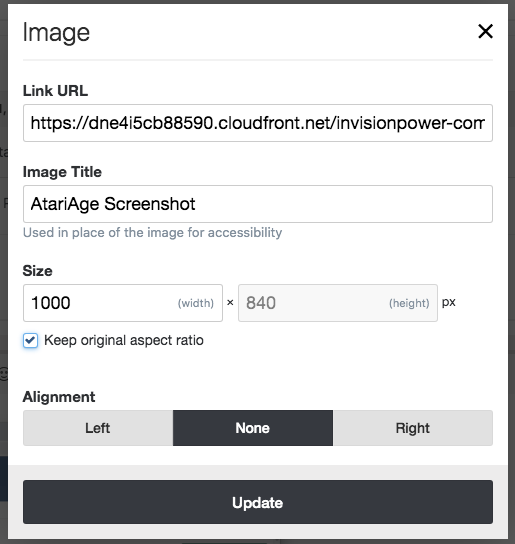 I am paying a professional skin developer to convert the existing AtariAge theme over to the new forum. I'll also be purchasing new versions of most of the skins we have available on the current forum, at least where upgrades are available (forum themes had to be rewritten from scratch for IP.Board 4.x). Some do not have upgrades available, so I'll probably purchase a few new skins as well. I also have some custom modifications to the current forum that I will need to rewrite for IP.Board 4.x. This includes things like being able to give people the ability to indefinitely edit certain posts. And there are various third-party apps/hooks/plugins I'm currently using that I need to ensure I have equivalents for with the new software. And I will be enabling new modules for the updated forum, such as "Downloads", which homebrew authors will be able to use to post their game binaries, and versioning is supported (among many other features). In short, I really have my work cut out for me. I'll post updates here as I progress.. Right now I'm working on doing the first test conversion on the new server.. This particular step is simply changing the character encoding of the entire database, which is necessary before the actual conversion can take place.. This step alone is going to take hours, but it may be something I can do to the live forum before I do the final conversion (which would save time when the site needs to be converted over). I have to be careful, though, as I don't want to cause any problems on the live forum. I'll get into some of the new/changed features of the upgraded forum as I have time.. This is awesome news, thanks for sharing the process with us. If there's any user-facing functionality that needs testing, just shout! I'll definitely ask some people to help bang on the new forum once I get to that state. I can't wait for people to freak out given how different the new software is relative to what we're running now. 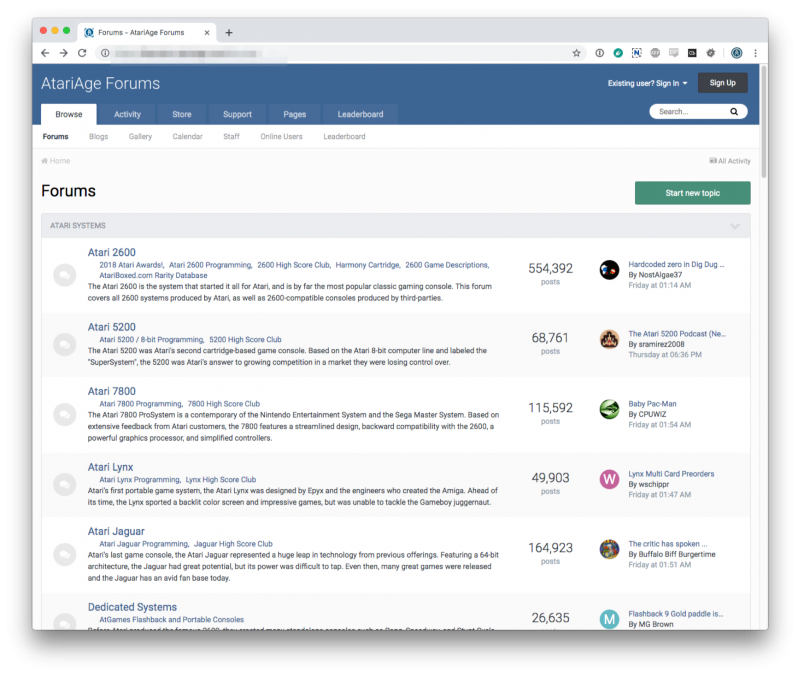 It will help to have some members become familiar with the updated forum, as well as try out all the features to make sure nothing is broken (and this includes with the custom theme). Turns out that after six hours, that conversion process hung and never moved beyond what I posted a screenshot of above. So I filed a ticket and am waiting for Invision to respond (which probably won't be until sometime tomorrow since it's the weekend). I expect to run into various issues like this. Wowzers. Hope they get back to you with a fix ASAP. They have, but their suggestion didn't work. So I had to respond again to the ticket. I have the main site running on the new server, although I am not finished with all the work I have to do on that front. However, I should be able to finish that up with a few full-time days of work. The forum upgrade isn't going as smoothly, though. 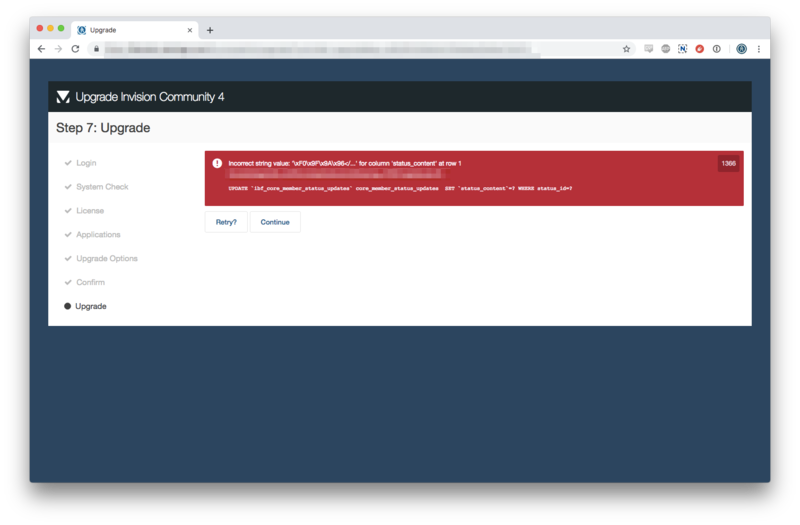 I still have not been able to complete an upgrade of the forum database, and I'm waiting on Invision to take a look at it. May also try to solve it myself as I'm not sure how long it's going to take them to investigate, as this is outside their normal support since this is on a test server. However, there's no way in hell I'm going to try and perform the upgrade on the live server without being secure that it'll work!! So, this is a bit annoying and is stopping me from doing a ton of work that is required on the forum. I can't do squat with it, though, until I can successfully convert the forum database. I did copy some 250GB of attachments from this server to the new one, though! I also need to get the store up and running on this new server. I also moved several other classic gaming websites that were being hosted on this server to another, as I intend to only have AtariAge.com running on the new server..
Al, thanks for all the Hard Work on the AA site! Having not heard from Invision yet on this, I made a public post on their forum earlier today hoping to elicit help from other forum admins with technical skills. I'm also digging into it myself -- it's definitely a utf8 charset issue (more technically, utf8mb4), probably an invalid Unicode character that their upgrader is trying to insert into the table.. I'm having to some light reading on that subject to get up to speed..
Also going through their code, I may have to install Xdebug on this new server so I can step through what this particular upgrade routine is doing. Ran into another snag today -- got past the above converter problem and made it further through the process, but ran into another error I cannot get past. Updated my support ticket at Invision and now I'm just waiting for them to respond. This is pretty annoying -- if they don't give me a solution sometime tomorrow, I'll probably have to wait until Monday before I get another response. This would have been a disaster if I tried doing this on the live forum without having a test copy of the forum installed on another server. Measuring twice to only cut once pays off yet again I'll defer to the forum update pic I sent you the other day. I think about half of those are Flojomojo's posts in the Ataribox thread. Thanks for all of the hard work on this Albert! 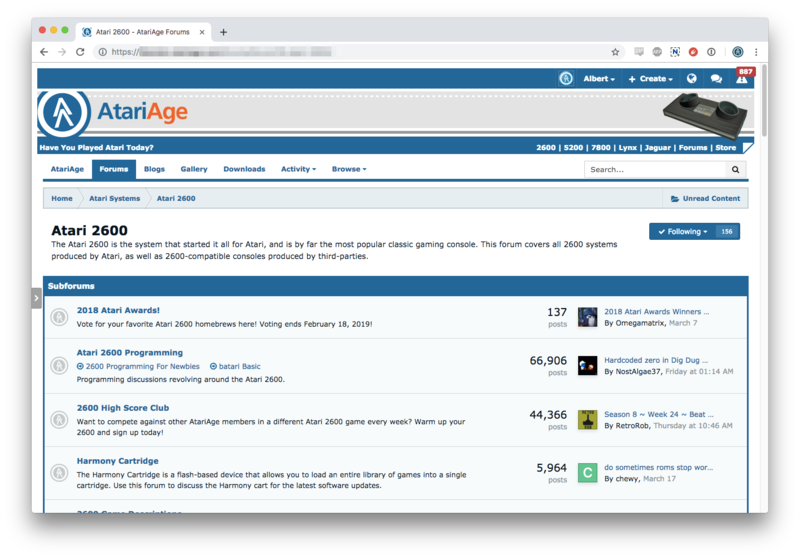 I've seen other forums that I frequented over the years die off, and it's nice to see that AtariAge is in good hands. If AA wasn't around, I have no idea where I'd waste several hours out of each day! Albert, thank you for your hard work and devotion to AA. I really enjoy being a member here and enjoy spending time with the great members of the community. Thanks for all of the hard work on this Albert! I've seen other forums that I frequented over the years die off, and it's nice to see that AtariAge is in good hands. Same here. I am only worried what would happen to AA if something happens to Al. If AA wasn't around, I have no idea where I'd waste several hours out of each day! I cannot see you wasting any hours here. Thanks for the kind words! Glad you guys are enjoying the site. I have finally completed a conversion of the forum! However, the forum doesn't quite work right..
Now have the main index of the forum working, but not a single link on the page works. So, more progress, but it is slow going as I have to report problems to Invision and then wait for them to respond.. And I have to keep meticulous track of everything I'm doing, since I will need to do this a few more times including when I'm ready to upgrade the live forum..
Just a note, this is the default, plain forum skin. I have an AtariAge skin ready to go (although it'll need some tweaking), but I can't install it (or any other skins) since nothing else works at the moment. I'm really happy to hear you've paid a professional to convert the old skin . It really is a big thing for me since I personally can't stand the modern material/flat/whatever design and what we have now is quite perfect anyway. 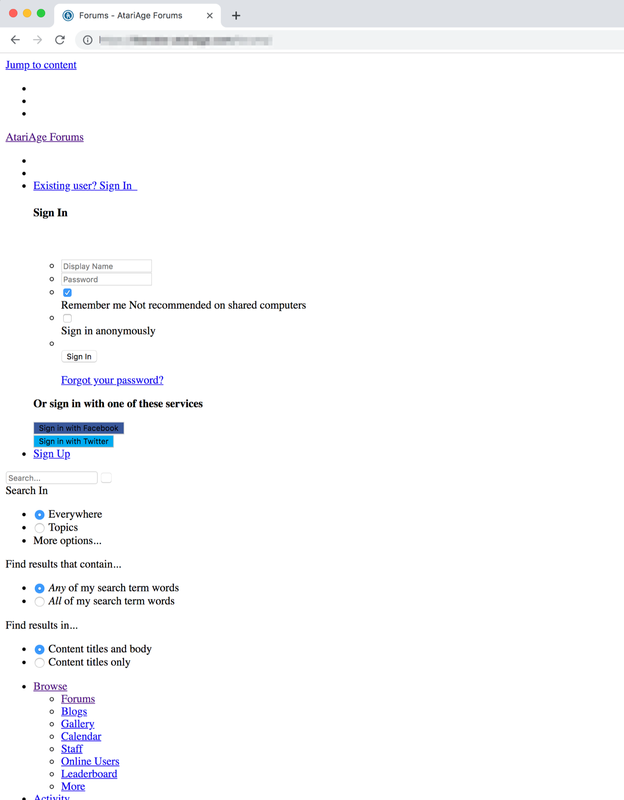 The other thing which usually worries me when seeing forums transitioning is moving to the Markdown system. Is the new forum going to use it or is it still good ol' BB? You can also drag and drop images and other files directly into the editor. You can even directly edit the image dimensions in the editor. 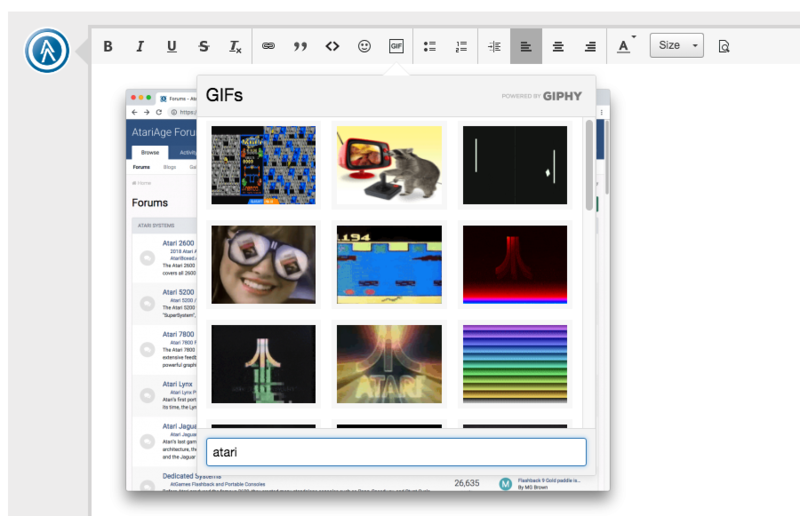 and did I mention the bit about built-in animated GIF support? I have enough to do already without having to (perhaps poorly) spend time to recode the existing forum skin from scratch. Much better for me to pay a professional that is already quite familiar with IP.Board 4.x. 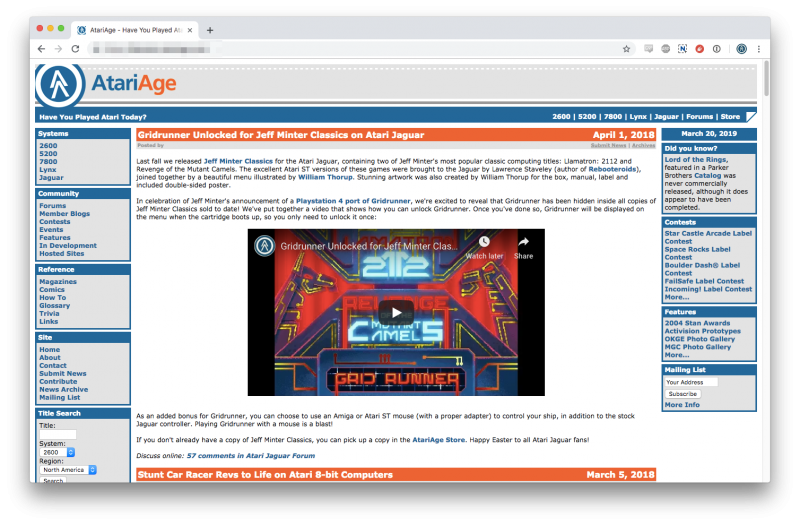 I look forward to seeing the skin running against the AtariAge forum database, and I should be able to take some screenshots later this week. There's still some tweaking that remains to be done with it. It's a third-party editor called CKEditor. It's much better than the editor on this forum. That new editor looks really cool (the current one has some annoying issues). I wonder if we can extend it to support e.g. 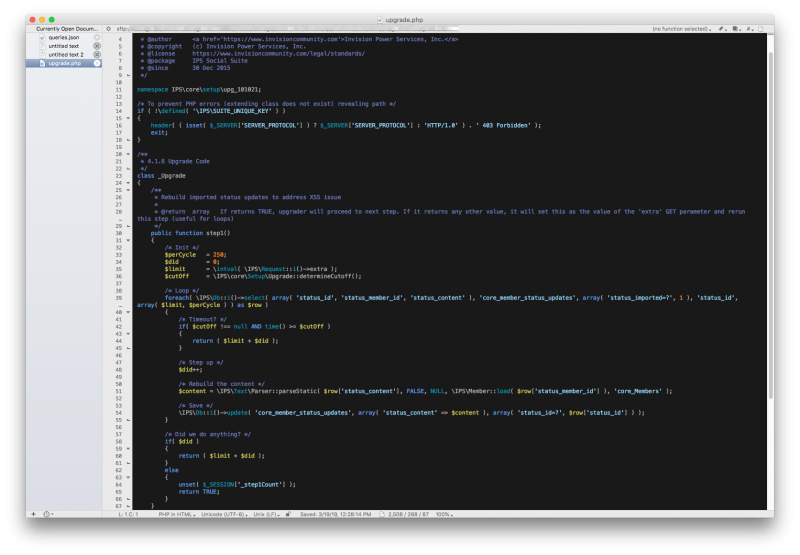 DASM syntax highlighting. Do you know? Edited by Thomas Jentzsch, Tue Mar 26, 2019 5:21 AM. Now that I have this working, I can really dig into this and make some progress. Very nice! Looks like the comfortable look we all know and love with new horsepower under the hood. This will be very cool. Only 887 warnings to go!